Looking for the best refractor telescope? Then look no further than this list containing the best of the best. Refractor telescopes are sometimes preferred to the other types due to their specific feature list and portability. This list will show some of the more popular ones and why you should consider each. 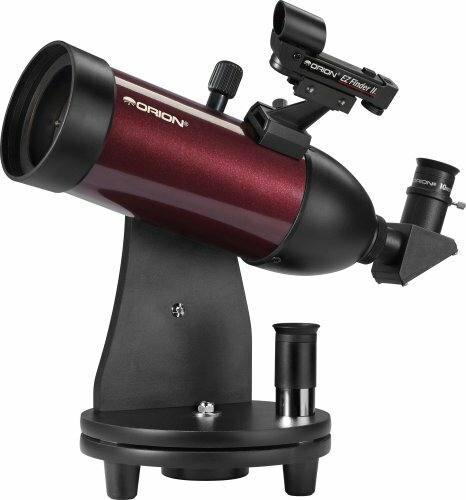 Starting out the list is the low priced Orion 10013 GoScope 80mm TableTop Refractor Telescope, a powerful little product that offers lots of mainstream features. Using the full 80mm aperture of this small scope will give you an incredible amount of options when it comes to viewing the galaxy. There is enough power in this small telescope to even see the cloudy nebulas in great detail. Included in the package is an EZ Finder II red dot sight that lets you aim the scope more accurately to points in the sky. Not only will you have a better idea of where things are and be able to mark it on the map, but it becomes infinitely easier to follow those points in the future. Since this is a smaller refractor scope it is made to be portable and taken anywhere, or put on a desk in an office window. If you have a compatible tripod with a 3/8 inch or 1/4-20 threaded post then you can mount this to it. Besides the extended versatility of a steady base, buyers can comfortably use this at or away from home with the same comfort level. First on the list and one of the most customizable, the GoScope is an impressive addition to the list. 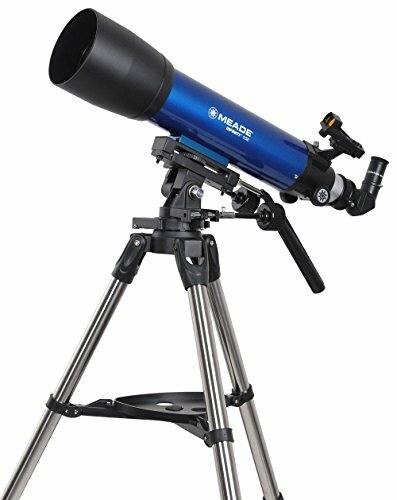 This Meade Instruments telescope is a medium priced product that comes in both standard and frustration free packaging. If you’ve ever had problems with opening a package, then chances are the frustration free version will be a good turn of events to your evening. With an aperture of 102mm this instantly becomes one of the most powerful telescopes on the list, and easily in the top 5. Using the advanced features of the rack and pinion focuser doesn’t take long to get used to, and is simply one of the killer features of the scope. Tracking is precise due to the slow motion controls and altazimuth mount with panhandle. Following that streaking comet across the sky will be less taxing on your mind when you have equipment this steady. This includes day and night tracking, with the former being a feature that isn’t always the best on scopes of this size, but on this one manages to be a winner. Customers will be able to take advantage of low, medium and high magnification settings with a 2x Barlow lens doubling the magnification of each piece. If you’re interested in power, then this will go down as one of the top choices on any list. Keeping at the low pricepoint is the SkyScanner, a product more than capable of producing some of the best imagery available in such a small size. It works well as a first time telescope for beginners but without cheapening out by using plastic materials for the lenses. This means beginners will get professional grade quality but not get overwhelmed with extra features that they won’t use. As far as power it has a 100mm parabolic primary mirror optic, making it one of the contenders for strongest on the list. No detail will be missed while viewing this small portable telescope that can fit on your desk or even in your desk drawer. The viewing angle is perfect to get the most out of your space, even when trying the zooming options. A wide angle maintains the perfect focus while keeping you as close to the action as possible. 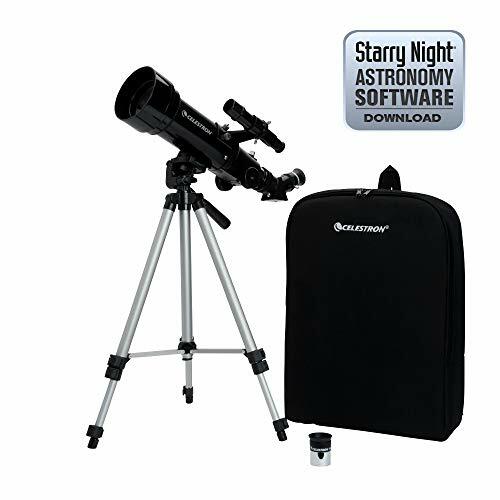 Included in the package are two 1.25 inch telescope eyepieces of 10mm and 20mm, an EZ Finder II aiming device and Starry Night astronomy software. It ranks easy as one of the premier scopes on the list for beginners, and even better if you’re looking for the best refractor telescope on the list. The low priced Celestron 21035 Travel Scope has a lot of interesting features that work in its favor on the list. There are two versions of the scope with the 50 and 70, and they both come with a backpack. With many of the telescopes on the list not coming with a carrying bag, this is a real bargain for buyers that don’t want to break the bank by buying extras. As far as the quality of the scope they kept it professional with all coated glass optics so that the image was true to form. Viewing is corrected automatically since the images are erected diagonal, keeping them from being in the wrong orientation. Locating objects in the night sky is a breeze, and you’ll have full control over the altazimuth mount that operates as one of the surprising mounts on the list. Even in areas where you normally wouldn’t be able to get a solid surface, this mount proves more effective than others. And with a no tool setup to speed along the process, you’ll be ready to go faster than any of the other stargazers to the next spot. All items fit comfortably in the bag, and comes with “The SkyX- First Light Edition”, a strong beginning software piece for beginner and intermediate users. Not a bad deal at all, and with enough extras to keep you from going back to the store for more. For the serious astronomer comes the most expensive item on the list, the rare and high priced Orion 09565. Buyers that can afford it will get treated to the most powerful refractor telescope on the list, with a total of 130mm power to play with which is still considered a steal at the current price. Using a three lens ED optics with a fast focal ratio, looking at images in the sky is crisp and smooth. And even without using a mount, tracking is remarkably easy for this type of scope, a nod to the build quality. Keeping with the power side of things, they included a 3 inch dual speed Crayford focuser to help observe and pinpoint specific areas in the galaxy that interest you. In order to protect your investment it remains portable and highly durable with the two split-clamp tube rings and triple latch hard case. No harm will come to this scope if you take moderately good care of it. It’s a bit on the heavy side at 39 pounds, but you won’t find anything else like it on the market. Dimensions are 32×5.1×5.1 and it excels at being portable while blowing away the competition with features. If you want the most powerful scope on the list then this will be your best bet as it wins, hands down. This medium priced gem is a good example of why Orion continues to dominate the sales charts. The full 90mm aperture gives long deep looks into space meaning, providing one of a kind detail with crisp optics and handling. Even with its focus on deep space exploration, it provides a wide view so even at the highest magnification you get the whole picture while viewing space. The altazimuth equipped mount was built from the ground up to be manageable for both beginners and intermediates. Even the slow motion controls don’t take long to get, and you’ll be able to track comets in the night sky in no time flat. An included Shorty 2x Barlow lens doubles magnification if you can’t get close enough with the embedded lens. It is a good booster that is easy to apply when you absolutely need it without getting in the way. Included in the package is the Star Target Planisphere and MoonMap 260 which functions as a complete starter set to get you started with looking at the Moon and stargazing. As if that weren’t enough, they even squeezed in the Discover the Stars book as a bonus for buyers. If you want a great deal that will last a couple of years in value, then look no further than this telescope. Just right above the low price point and into the medium price range is the Astronimcal Voyager with Sky Tour by the popular Bushnell company. Available in both 60mm and 70mm versions, there is little to hate about one of the most professional telescopes on the list. It also has the best design, screaming Bushnell quality before you even open the box. An LCD handset and LED red dot finder scope are included to get you going right out of the gate with your stargazing. 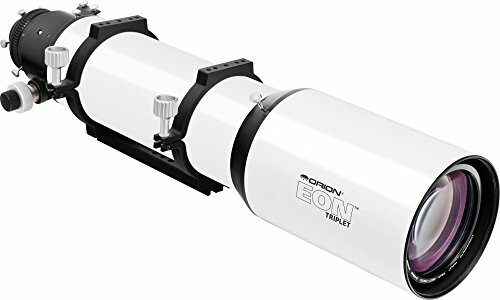 Keeping with the theme of making equipment for night use, the illuminated smart mount will keep you from having to randomly adjust the telescope when you are tracking at night. And after you open the box, everything comes in set pieces making the install natural and frustration free. There isn’t an item on the list that can touch this scope when it comes to positioning speed and advanced technology for the money. It is in a league of its own, and clearly the best product on this list of refractor telescopes. Weight only 3.3 pounds with dimensions of 37x13x8.8, pound for pound you’ll be hard pressed to top this deal anytime soon. Going down as probably the most expensive telescope on the list, the Omni XLT earns its stripes early on with superior build quality and one of a kind features. The extra strong 25mm 1.25 eyepiece was a great companion to the 6x30mm LER Finderscope. From point A to point B, there is nothing you can’t find with this telescope if it is within range. The tripod is also the best on the list with an included 4 pound counterweight to keep it balanced while you use it, even aggressively. You can add as many accessories as you want to the tray and marvel at how useful the Dovetail mounting plate is in smoothness compared to lesser models. With each scope having its optical glass hand chosen by quality, buyers are guaranteed the best with each and every model. And of course the StarBright XLT coatings not only help with the transfer of natural light, but gathers additional light for maximum potential. Field of view is about 50 with a 20mm eye relief. And for buyers interested, the CG-4 German Equatorial mount with setting circles has no competitor on the list. So if you’re looking for the telescope with the best mount, then your wallet will end up with this as a first purchase. Second to last on the list is another high priced Orion model that seeks to offer more advanced electronic features than the standard set. Buyers will enjoy a multitude of accessories that each provide an advantage other generic scopes when stargazing. An incredibly rich 900mm focal length gives this scope an edge with power over even the most expensive in the industry. And when paired with the 80mm refractor it’s no wonder the images come out looking fantastic at every turn. The built in GoTo database has over 42,000 objects that will keep you busy for weeks without worrying about pinpointing specific places and getting lost. And if you just want to sit back and enjoy the stars the automated tour mode acts as your guide to some of the best views on any clear night. With a hand controller that is easy enough for all skill levels to grasp, the hardest thing you will have to master is taking it out of the box. Other accessories that come bundled are an ac to dc adapter, view enhancing moon filter and detailed MoonMap 260 mapping out the best features of the Moon. There is nothing wrong with a little technology in a telescope, and this model does a great job of showing you why. 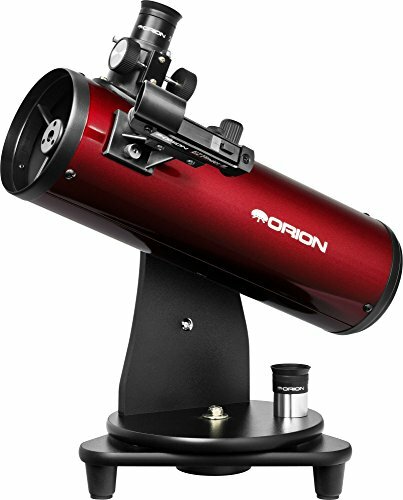 Last on the list is a low priced Orion, a model that offers a great telescope at an affordable price. If you’re just getting into refractor telescopes then this may be a good introduction, as it keeps the price low but the parts at a super high level. The 70mm aperture is good power that handles natural light really well so that you get both night and day pictures that are worth a second and third look. Star clusters and even the Moon are shown with nice clarity on clear nights, with help in spotting some of the better sights coming in the form of a manageable altazimuth telescope mount. Movement in all directions feels good, and adjusting the height takes a matter of seconds. Accessories that they included are 2 explorer II 1.25 inch eyepieces, an EZ Finder II reflex sight, and a 90 degree mirror for diagonal views. The option to have better daytime viewing with an add on is optional and not included, and the name of the accessory is a correct-image diagonal. This is a pretty food money to value deal that will be more than enough for the average consumer. So if you just want to get something to get started, this refractor telescope comes recommended as a safe buy. If you’re looking for a maintenance free and durable telescope then getting a refractor telescope will become a priority for you. Their closed off design and lack of extra moving parts makes them a huge plus for the buyer that wants to travel a lot. This plays right in the hand of the refractor telescope since many are made to be as portable as possible. Beginning scopes of these type often make it to the intermediate and expert level while still operating at 100% capacity. They also edge out reflector telescopes for daytime viewing, but keep in mind for that some require an additional accessory. Even in that case, the accessory is easy to buy and doesn’t cost a lot of money. So if you want to drop a lot of money on fantastic equipment but are afraid of it breaking, pick up a refractor telescope and enjoy the extra security associated with this type of model. There is a good amount of reasons to love refractor telescopes, and if the feature list doesn’t get you then the great pricing will. The technology for these types of telescopes continues to get stronger each year, but the prices stay the same regardless. With so much value being packed into the technology and the customers getting the benefit, refractor telescopes are very much a fan favorite among some in the community.